Resortera is the name we use in Mexican culture for a Slingshot, so this is my blog about Resorteras as my style and traditions in slingshots are from Mexico. Many aspects of the Resortera will be covered as time allows, keep in mind I am a hunter so a lot of what I teach is based on using the slingshot for hunting. Even still if you shoot targets you could learn something from my blogs. 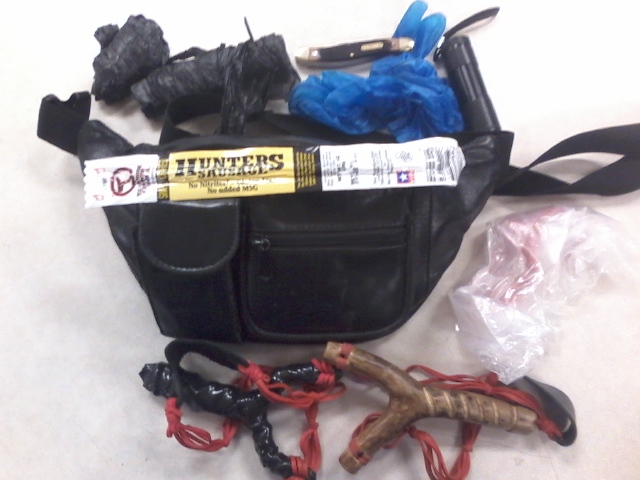 Urban small game load out: A slingshot hunter's small game hunting pack. One of my older hunting packs. In the last few years I had noticed that my usual hunting essentials had started to overcrowed my cargo pant pockets or my jackets during the winter. In essence it had started to become impractical on many levels. Some time last winter in 2015 I started to put together a winter rabbit hunting bag but that bag evolved into a complete outdoor system unto itself. Was this my first slingshot hunting pack? No not at all. A few months back while doing some summer remodeling I came across a black leather fanny pack at the bottom of a box I had filled with odds and ends that needed organizing. 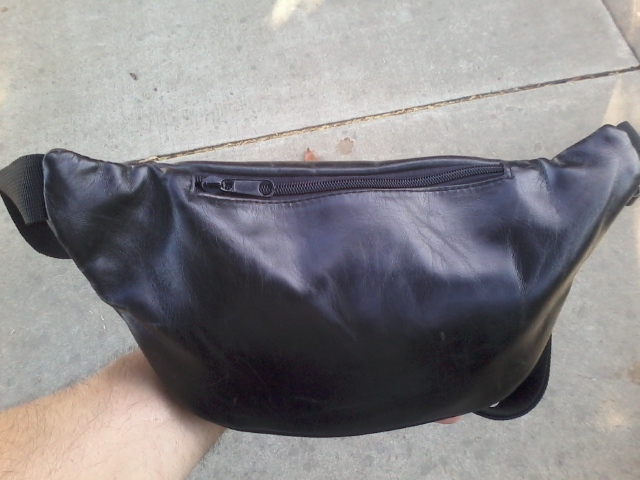 I looked over the bag and decided to look into its contents, lo and behold this was a fanny pack that I had used for my slingshot hunts some seven years ago circa 2009. Inside the pack were over a dozen 1/2 inch steel ball bearings and in one of the larger compartments was full of plastic bags (game storage bags). So many crucial events had occurred in my life in the last 7 years that I had completely forgot about this hunting fanny pack. 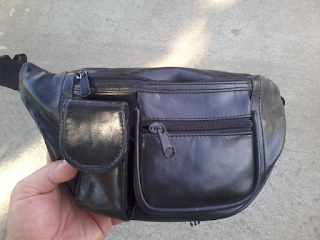 I showed it to my wife and she jogged my memory about it, she had purchased the fanny pack for me to have for my hunts. In her own words it was perfect for wearing in town and for my urban hunts that might lead me to the railroads or other good hunting places. I have since reinstated the use of this very practical hunting pack that travels light and holds my essential gear for my hunts. The fanny pack is not huge but it is medium to large in size yet for its size I have been able to carry most the things that I will need in a day hunt. Everything minus a cook kit but a cook kit is used in longer hunts. Even still I am able to pack a light snack to keep energy levels up. 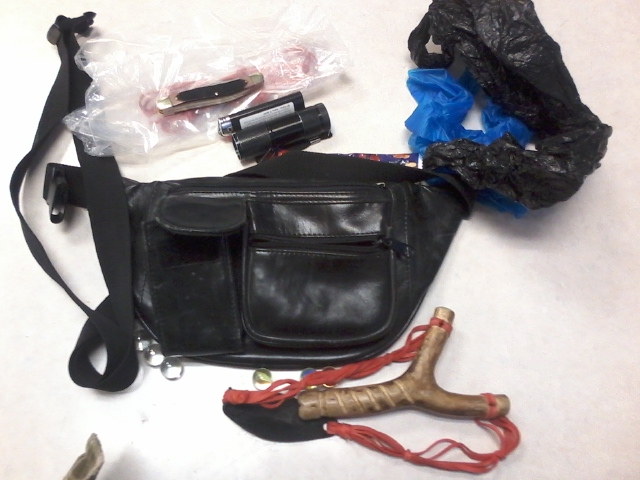 Here I share several pictures of my small game slingshot hunting pack. Here's a front view of the pack the front right pocket with a zipper I use to fill with my ammo currently it has 5/8 cat eye marbles that are my standard hunting ammo for the barn pigeons at my work place that I am permitted to control so they wont contaminate the fresh crop. The smaller pocket where my thumb is fits my qwerty phone or a can of pepper spray useful for deterring bipedal as well as quadrupedal predators. The zipper immediately above these smaller pockets fits my main slingshot and a back up slingshot. Here's the back side of the pack and the other large zipper compartment. In here I fit an assortment of items from additional ammo to game bags as I will show in the following pictures. Here's a picture of the hunting pack after a successful hunt at work in which I harvested a barn pigeon. It is less organized in its presentation but you can see some of the contents including the 5/8 cat eye marbles and some clear marbles. The main hunting slingshot of the season, I will go more into detail in the following picture. A lighter (fire making) always have this. Back zipper pocket contents: Game bags, plastic gloves for dressing game, a pocket knife for the dressing. A small flash light as I work nights at my agricultural job, the lighter does not show but is under the gloves. A Hunter's brand Sausage by Tillamook just a snack to keep your energy levels up when you're on the trail. To the right is a plastic bag with spare chained rubber band sets ready for a quick replacement if the bands on my shooter break. My main hunting slingshot of the season a magnolia fork with chained red clay pc(platinum crepe quality) #32 rubber bands chained 3x3x3, also a back cup shaped alambre resortera with the same chained rubber band set up. 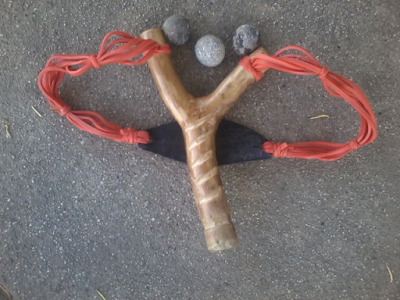 This is my basic small game slingshot hunting pack, simple and easy to work with. When in use I will usually take out the main hunting slingshot and carry on my person and to reach for ammo I just open the front zipper pocket and take a few marbles and take my shot when I see my quarry. If I make a kill I will reach in the back pocket for a plastic bag to store my harvest until it can be dressed. I have since added to small travel size pill bottles/cylinders with .38 lead balls and one with .44 lead balls. If this inspires you to make a similar small game hunting pack? 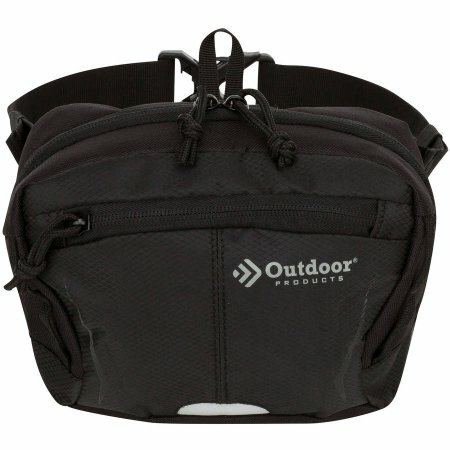 by Outdoor Products it is called the Essential Waist Pack. Note: It is slightly smaller than my leather fanny pack so more creativity and space management must be put into consideration with this pack. The picture does not show it but this waist pack also has a back pocket and in it I will place my gloves for dressing game and the plastic small game storage bags. It only cost me just under $6.00 a worth while small game pack light and easy to hike with. The choice is always up to the imagination of each hunter. Just my own ideas and how I pack my hunting gear. Good Luck on your Hunts..
Disclaimer: The information on this blog post is intended for information purposes. As with all matters related to hunting check with your local hunting regulations before engaging in a hunt for any of natures wild critters. What you do is solely your responsibility and it is unwise to expect others to be held accountable for your own actions. Hunting images are displayed in this blog post, if you do not agree with hunting please move on to another blog that is suited to your interests. My own personal disclaimer: I don't claim to be an expert at anything I do, as I feel there is always room for learning and growth. Despite having decades of experience in hunting small game. As a slingshot hunter I feel I never stop learning. To that end unlike some of the plagiarists out there (you know who you are). I will always give credit to my information source this is the right thing to do as pretending you are some expert based on Sponging information from various authors does not make you any kind of expert. Except being an expert copycat. A lot of folks out there have formed this opinion that I am this pure Urban Hunter. Yes I am an urban hunter but I was not always an urban hunter, I developed my slingshot hunting skills in the farm landscape of rural Mexico where I often visited my grandparents every summer in Central Mexico. My grandfather had cattle and maize and sugarcane fields and he also had sheep which we often helped him with all his daily activities which went from dawn till dusk. In this rural farmland we me and my brother were not the only slingshot hunters in the region. Which meant that all the creatures we hunted were always wary of young boys stalking them with their rubber powered stone shooters. Because we also traveled through the various states in Mexico in route to Central Mexico we also visited our family Chihuahua Mexico so we had a chance to learn to hunt small game in the Chihuahuan Desert landscape. These skills honed me for later hunts as a kid in So Cal back in the 1980s my father had friends who owned land in the So Cal Deserts so these skills developed in the Rural Farmland of Mexico helped us all around and continued when we had the chance to hunt in these Desert properties. Indeed my first rabbit was taken in Rural Mexico with the help of my grandfather's dog who chased it into a rock fence at which I dispatched it with my homemade resortera at the age of 9 years old. You never forget your first rabbit as a slingshot hunter. I took these skills to the concrete jungle as well and learned that you can find the same game in the Concrete Jungle (Big City). It has been a great road to this point and I'd like to share some of my insights into my personal experiences in hunting what I consider the greatest prey of the slingshot hunter. It is not the biggest or toughest (but they are tough), rabbits are both challenging, elusive and absolutely exciting to pursue. They raise your awareness as a hunter and teach you the art of stalking and tracking to a fine point. Not to mention a high quality protein source. So read on and I hope to not bore you with my tales of old hunts. A lot of the information is both a combination of my in the field experience hunting rabbits in various habitats and it is mixed with research notes compiled from various resources some online. Where I can I will have a bibliography list at the end of this blog accrediting the various information resources that helped me in my search for rabbits in the various terrains both in the Concrete Jungle and at the door of the wilderness just outside of the City where things become wild again. Your rabbit hunting set up: Obviously before you can start the hunt for rabbits you need to have the proper hunting tools for the job at hand. 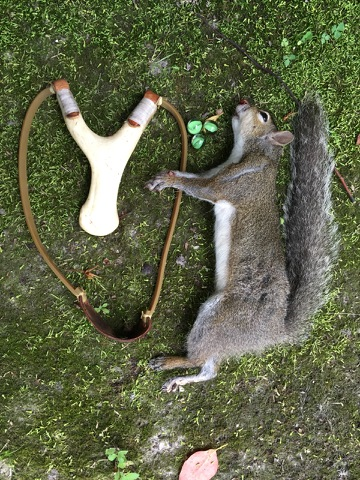 I was raised in a tradition of making my own resortera/slingshot as such I will share some of the set-ups I personally use and I will give some of my two cents worth of advice for the aspiring rabbit hunter who is just starting to hunt with a slingshot. I like to use chained rubber band bands for my slingshots for all hunting but they are very effective for hunting rabbits. The ammunition will vary, personally I have always liked using rounded pebbles but I have always believed that you should be prepared for varying circumstances as such I will carry different types of ammo to suit the challenges of the hunt. Canicas aka Marbles I have been pretty successful in the use of the 5/8 cat eye marbles for rabbit hunting as long as you target the head you will do very well. Also the clear marbles sold for decorative use are slightly larger than 5/8 these are better in that their slight larger size gives the marble a little more weight so better impact. More info and examples on the reason for having varying projectiles for a hunt is found here on my old blog post. Personal Disclaimer: Not all slingshot shooters are able to use varying projectiles with the same accuracy. I'm able to do this because I have been shooting pebbles/stones for decades and no two pebbles weigh the same. This means after years of practice my subconscious mind/nervous system is able to automatically adjust for the varying projectile weights when shooting with the slingshot. Another Disclaimer: If you are just starting with the art of the slingshot and more importantly have gotten to the point where you can now consistently shoot with accuracy? Now you decided you want to fill the pot, I would stick with using one sized projectile for hunting. Rather than turn this into a list of projectiles with pros and cons I will just say what I have used successfully and if any of the information in my blog post is of useful to you then give it a try. As above regarding the use of marbles, I have also used 1/2 inch steel balls to take bunnies and I have used .44 caliber lead balls to take a cottontail in addition to using the larger 50 caliber lead ball. Not forgetting that I have also taken my share of rabbits with hand rolled and sun baked clay balls and with the humble pebble. Again I discuss this variety at length on the links to my old blog posts. Whatever projectile you decide to use for hunting rabbits, make sure you use the same projectile in practice that you intend to use in your hunt. If you do not favor making your own slingshot and are like me a hunter on a budget? 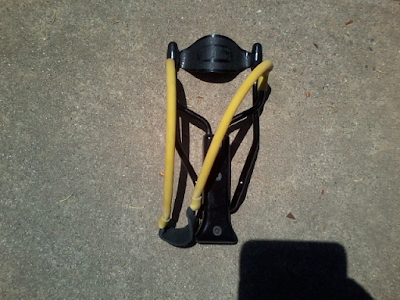 Then you can always buy a sporting goods slingshot like this Daisy Power line B52 wrist braced slingshot. It is a foldable slingshot so it will fit in the back pack. It packs enough punch with its factory tubes to take rabbits and other small game. The projectile pouch is not large but will work fine with 5/8 marbles and rounded stones of similar size. 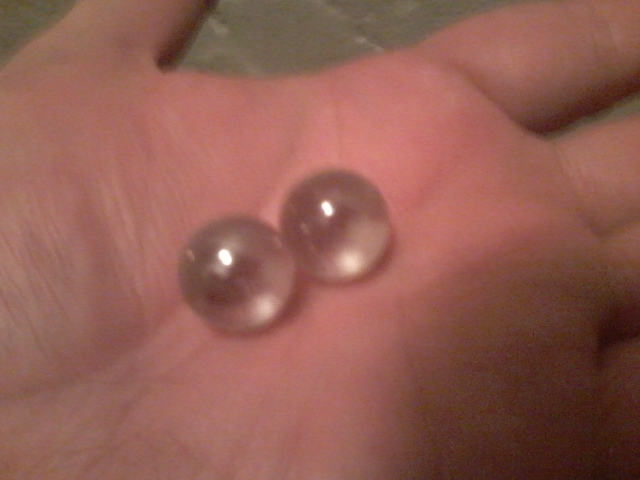 You can use it with cat eye marbles for rabbit hunting to 1/2 steel balls. The choice is really at your discretion. But for under $10.00 you can have a good slingshot that will do the job. This is just an example and believe me I know a few slingshot hunters who use only the wrist braced slingshots and are absolutely deadly with these factory made slingshots. The choice to use a homemade slingshot or one of these well made and highly functional sporting goods store slingshots is always at your discretion. My view is that the slingshot is the poor man's hunting tool and it should remain affordable to the poor man. I know there are now cottage vendors of custom slingshots but some of these guys are asking $35 to $300 At these (higher prices in the 100s) we start to lose our heritage the simplicity of the poor man's hunting tool is lost. My grandfather would turn over in his grave at the thought of a resortera being so expensive! I know this would seem pretty redundant to an experienced slingshot hunter and if you are an experienced slingshot hunter then you could skip this part of my blog post or please read on as there is a very important point to this section. It should come as no surprise that targeting the rabbit's head is the best way to secure a clean kill and ensure no prolonged suffering. I include the diagram of the rabbits skeletal structure in relationship to the rest of its body. Now I will review a few places on the rabbit which will also kill a rabbit quickly, one place is not immediately fatal but will prevent the rabbit from running off into the bush and die later. Note: the numbers are listed from the diagram in order of the most ideal vital target to the least. 1. on the diagram is the cranium (skull) the prime target on a rabbit this is an instant shut down for your quarry. As you can see this is a really small target for this very reason I make it a point to practice shooting at small targets but more on that later. This is the brain and if you use a projectile with a larger striking surface like a marble or similar you can be off by a fraction and the projectile will still shock the brain and deliver a clean kill. Personally I just try for their big dark eye when see the rabbit in a side stand (the ideal shooting position). Usually with my slingshot set up this results in an instant kill. 21. Is the atlas this connects the skull and the cervical vertebrae impact here results in a total disconnection of the nervous system from the brain. I have only hit rabbits here by accident but I assure you it is also a clean kill. Usually those kills were with a heavy projectile. 20. The cervical vertebrae in layman's terms the proverbial neck bone impact here will either result in paralysis or total shut down. This largely depends on weight, speed surface size of projectile etc. 3. Spine or the spinal cord impact here will usually paralyze a rabbit, I really don't advocate shooting a rabbit here but sometimes rabbits will hide in form in cover where you cant clearly see their head when you take your shot this is a possible impact spot. What I personally try not to do is shoot deliberately at the body of the rabbit, as in the diagram we see a skeletal structure and that outline is to remind us that the rest of the rabbit is wrapped in muscle and sinew and has internal organs. I have seen some people give bad advice regarding shooting rabbits in the body, with the excuse that if you have enough FPE (foot pounds energy) it will work out. This is not sound advice and I realize that sometimes body shots with a slingshot to a rabbit do result in a kill/harvest. But there are always factors to consider before thinking this is sound advice. There's a vast difference in scenarios from body shooting a rabbit in the garden where you have the creature out in the open to shooting a wild rabbit near its natural protective surroundings. I have accidentally body shot rabbits with stones for ammo, also with lead balls, and with 3/4 marbles that were sitting near a blackberry bramble and the rabbit's adrenaline kicked in and the rabbit ran deep into the blackberry bramble to be lost and die a slow painful death (very sad moments in hunting). This happens even to other hunters who use a rifle, its a reality of hunting. I'd rather miss a rabbit all together by trying for its head and have it live another day for the chase than cause it unnecessary suffering (my personal rant). These are just some points to keep in mind and later on I will share anecdotes of rabbits I was lucky enough to harvest and some I accidentally body hit that I was fortunate enough to recover. Last word: To be effective at hitting the vital target areas on a rabbit you should take some time to practice on a small target such as shooting at either a target the size of a bottle cap to a target the size of a walnut. I personally shoot a stick target about 2 inches long by 3/4 inches thick. Though why I use the stick target will become more relevant in a future blog post. So where do you look for the elusive cottontail rabbit? Our wild quarry has learned to live in many diverse habitats due to man's ever growing expansion from living outside the realm of civilization to living within the confines of human habitation these fascinating creatures have adapted to life on this planet. First of all we must consider the basic needs of the cottontail rabbit and this is true of other wild creatures. The cottontail rabbit requires cover/shelter, a constant food source and safety by this is meant places where the rabbit can escape to safety from predators. When a suitable habit becomes unsafe for rabbits they will usually abandon such a place towards a safer habitat. Without a special order I will list some of the places I have found cottontail rabbits. 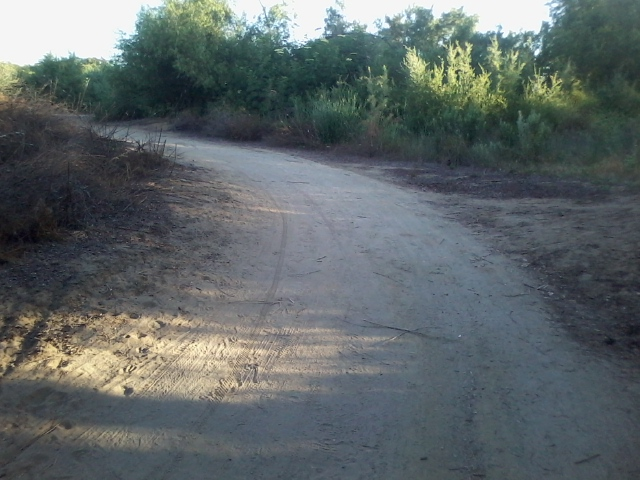 The picture is from a defunct railroad that leads down for half a mile to a place that has blackberry brambles beside the trail that was the old railroad in this place I have found a small population of cottontail rabbits. Live railroads that house brambles will also have a population of cottontail rabbits. Please be careful of live railroads as you never know when the train is coming. I remember as a child my father once took me on a ride to some railroads he knew and I didn't know he was hunting rabbits but that's what it was that he did. It was my first introduction to hunting small game on the railroads. What I like about rabbit hunting on the railroads is that its usually a straight forward line so it makes it easier to trail the rabbits, but not easy to stalk as most railroads have some kind of gravel which announces your presence to all wildlife. Never the less the railroad is still one of my favorite old rabbit haunts. 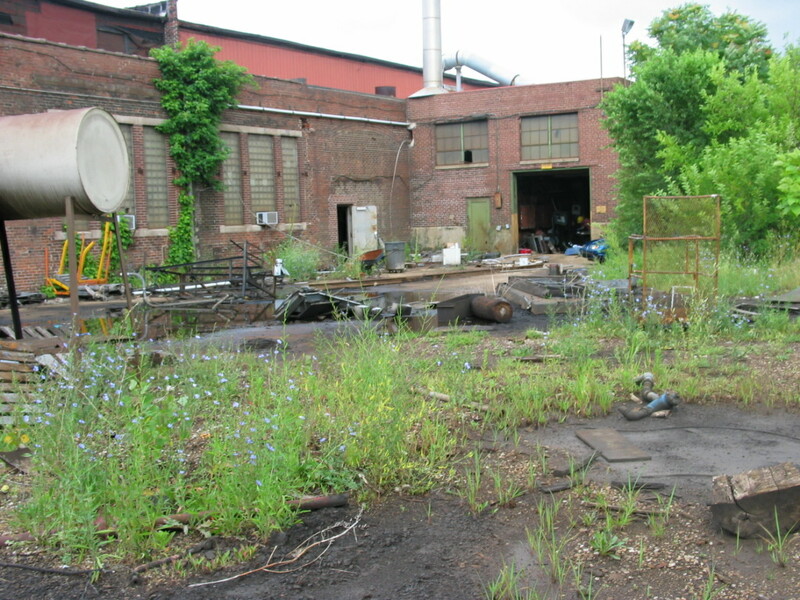 Industrial sites like the one in the picture (never been to it) but it is a good example of the types of places you can scout for rabbits. Especially if they have a field and piles of old lumber or old pallets are all hiding places for rabbits. 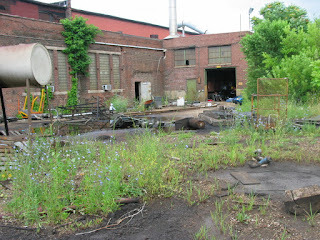 The outskirts of Power plants are also great places where there is uncultivated land and there are either wild growing brambles or old piles of branches, low cover brush or rocks piled are all suitable habitat for cottontail rabbits. I once saw a building that stored masonry supplies and was situated near some uncultivated rows of low sprawling brush and the building had piles of Pallets. This created a small habitat and it house a small amount of cottontails that hid in the Pallets and grazed at the edge of the brush. They were true City cottontail rabbits. Old style buildings that are raised will house cottontails year round, whether abandoned buildings or school buildings. I have seen rabbits in such places that had a track for running and had the raised buildings and steel storage bins. The rabbits used the storage bins as cover and would live underneath the buildings in the winter. 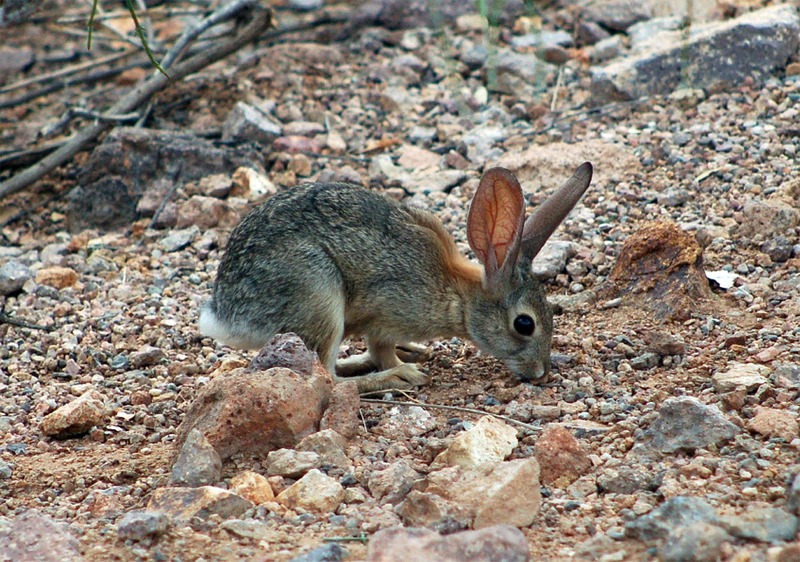 Cottontails can be found of course in Desert habitats as I usually hunt for Desert cottontails. In addition they also like Woodland habitats, I have seen these rabbits in a mix of woodland riparian habitats. 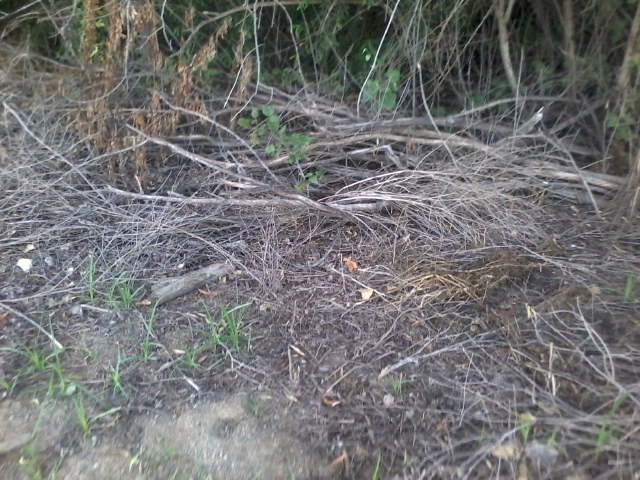 Places that have brambles and a lot of brush and tall grass for the rabbits to hide in. Here's a typical trail that can house rabbits, plenty of cover and edges for the rabbits to graze and feel safe. How do you know there are rabbits? 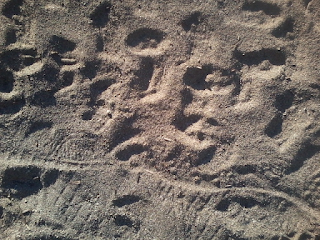 Look at the trail inspect it and you will find rabbit tracks? Like these tracks here, plenty of rabbit activity. 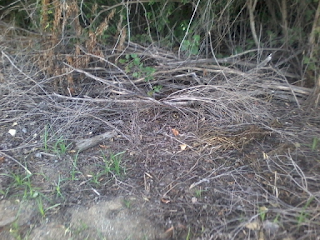 All are possible places to find cottontail rabbits, its up to you as a hunter to find the creature. I make sure I have my slingshot ready I inspect the bands make sure they are good and I go over what ammo I will be using and make sure I have enough once I'm out there on the trail. My basic small game hunting pack, will include my slingshot, I will also pack a back up slingshot (in case of emergency need) and spare bands for in the field repairs: my ammo with plenty of back up ammo (in my case varying ammo to suit the scenario), a pocket knife for dressing game, some plastic disposable gloves for dressing game, also plastic bags to carry game in. A fire source as you never know when you will need to make a fire. Some drinking water, I also carry an aluminum cup (sometimes) in case I need to boil some water (not likely but you never know). Aside from this the morning of the hunt before I take to the field I will either have a small thermos with my coffee or cold coffee for the hot summer days and pack a small snack some jerky or a granola bar just enough to keep the energy levels up while hiking the trails. My rabbit hunts are usually early morning and last about 1 hour on the trail unless I'm lucky then they last 30 minutes on the trail. Suffice to say the above supplies are suitable for such hunts. Early morning I will shower with water no heavy perfumed soaps or shampoos avoid that stuff before the hunt, and no aftershaves, colognes or deodorant. You can use that stuff when you are back home from your hunt because a shower and change of clothes are important to avoid bringing indoors, ticks, fleas or other biting creatures. To that end once I'm dressed up for the hunt I usually Spray OFF! Deep Woods on my pant legs and the rest of my body the exposed parts I spray with a solution of Alcohol blended with Cedar wood oil as this is a natural insecticide that is as lethal to ticks and fleas as Deet is to the blood suckers. I usually have a pair of clothes outside in my garage and a bag to throw the hunting clothes in to put in for later washing. Just to prevent any potential passengers from invading your home. Ticks are serious customers and can cause fatal illness so its best to play it safe. When I arrive at my hunting grounds I make a prayer to the woods or the spirit of the wilderness asking permission and blessing to hunt on its grounds for a rabbit or two that I may have to feed myself and my family. I'll have a cup of coffee and contemplate which trails to explore then I proceed on my hunt. My preferred hunting method is known by firearm using hunters as walking up rabbits. However it is slightly modified and this I admit this because after years of many rabbit hunts that came up empty handed, I have learned to tailor my walk up tactics. Generally there's no secret formula other than to remember that when you are walking up rabbits with a slingshot you aren't trying to make the rabbits bolt from their hiding places because its less difficult to target the vitals a rabbit sitting still than it is to target their vitals with your slingshot while they're on the run. 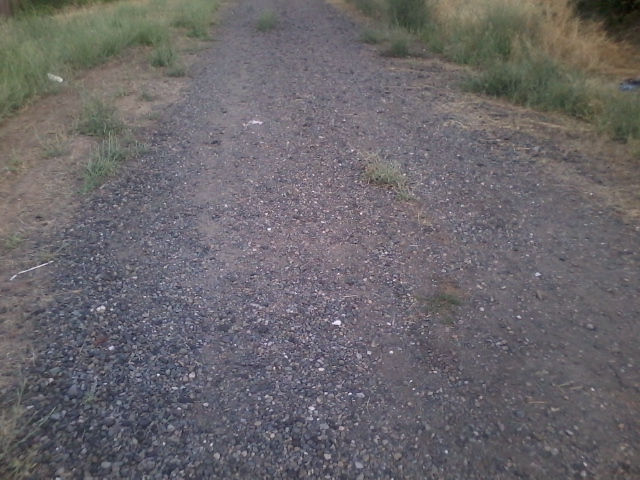 Patient and silent slow walks through a trail have often caused the rabbits to reveal themselves to me. In contrast the shotgun users don't mind if the rabbit bolts as the scatter shot will still get their bunny. Not the case with a slingshot. Sometimes they'll flush out onto the main game trail and stop long enough for a shot with my slingshot or they will go for the nearest cover and if I don't behave as if I noticed the rabbit and just calmly and slowly proceed to where the rabbit went into hiding? Sometimes I'm rewarded with a possible shot at the rabbit while its in cover and at a closer range. Personally I try to not do any talking or make any of the usual human sounds, I have heard stories from other hunters who swear that whistling will stop a rabbit that has bolted. I have also seen hunting videos from a traditional bow hunter who used this whistling tactic without success and then saw where he chose to not talk during his hunt and avoid the whistling and just take his shot when he saw a cottontail in cover finally succeeded in making a harvest. I personally do not use this whistling nor will I talk if I can help it, silence is my best weapon on the hunt for cottontails. Very often as I walk a trail and a rabbit bolts whether I had a chance to take a shot at it and missed? I will move on the trail investigating other spots and I often Double back on my trail as rabbits have a habit of returning to the spot you may have spooked the cottontail from initially. This has at times proven to be very successful for me. Some other things that I have learned is that it helps me to listen to the animals within the surroundings. If birds are singing normally then all is calm and this means that either no predators have recently been through the game trails or other humans. Sometimes the raptors will show you where there can be some hidden rabbits I have had this kind of animal to human hunter communication happen as I will share in the hunting anecdotes. What follows are past rabbit hunts: One time a couple years ago I was on a hunt using my old wire hanger slingshot with chained 64s and I had been walking a trail looking for rabbits and I came across a young rabbit on the trail ahead of me and the rabbit hid in some blackberry brambles. I felt it was a loss but determined I'd double back to this spot later when I was almost done with my hunting for the morning. As I doubled back I found this same rabbit grazing in tall dry grass which is the only reason I saw the rabbit as the grass was so dry. I tried initially to take the rabbit with a pebble but the grass deflected the stone so I stopped and the rabbit bolted across the trail in front of me and hid inside some tall Epazote shoots. The rabbit did not notice I saw its hiding spot, I was able to move in closer to about 15 feet and I had some 5/8 cat eye marbles in my pocket and I decided to give them a go. With the rabbit's back to me my first marble was deflected by the epazote shoots but it moved to a clearer spot and my second marble found its mark a perfect head shot. It made for a great Rabbit pot pie very delicious meal. The marbles worked just fine in this case. 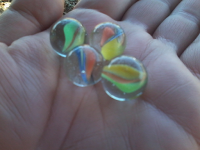 Here's another time I was successful with marbles. This time I was guided by of all things a raptor. I was walking a trail that had tall grass on one side and brambles on the other side, when all of the sudden a Cooper's Hawk swooped down to the left of me and just for a brief moment the hawk hovered over a patch of tall grass. Then the Hawk flew up to a tree sitting staring at me and I said "is this where the rabbit is?" I promised the raptor I would investigate it later. 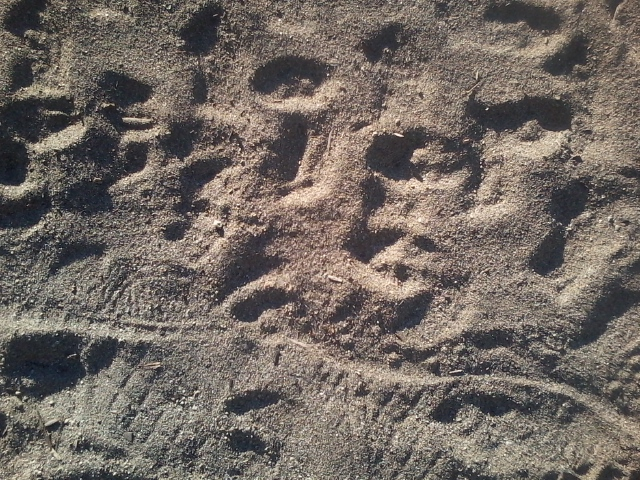 I explored another trail and decided to explore the trail marked by the Hawk on my way out. This time I had the some clear marbles that I bought from the Deco section of a large Department store. They are slightly larger than the standard 5/8 cat eye so carry more weight on impact. On my way out of the trail to end my hunt I walked through the trail where the Cooper's Hawk had marked the rabbit in the tall grass. To my amazement the Hawk was 100% correct! There stood 20 yards ahead of me a young cottontail and it was still eating size so I decided to end my hunt with a 20 yard try on this rabbit that sat ahead of me on the trail. I was trying for a head shot but was still getting used to varying distances with this particular slingshot. 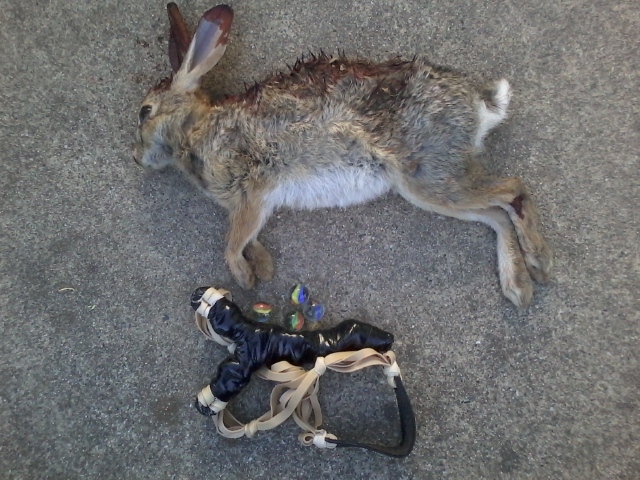 My first shot went over the rabbit's head and then my second shot impact solidly with the rabbit's ribs. It sat there hurt but I had a fear it would run off hurt into the brambles and be lost. 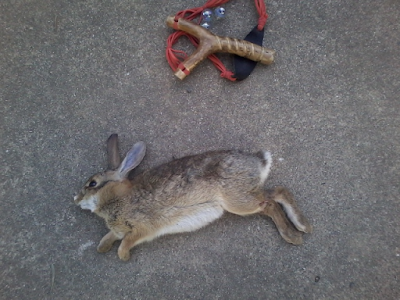 I tried a second shot at 20 yards on the already stunned/hurt rabbit. But the second marble impacted the same place, how the rabbit was able to run into the tall grass with this kind of impact was unreal. As I said before when an animal's adrenaline kicks in they can run off mortally wounded and hide. 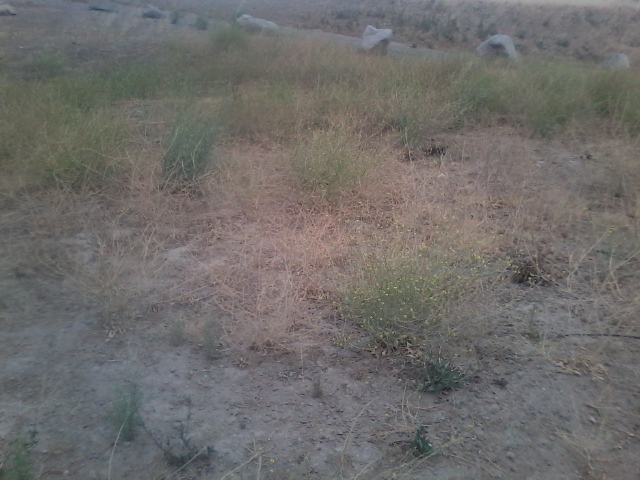 I took a chance at being bitten by a rattler and looked through the tall grass for the rabbit. 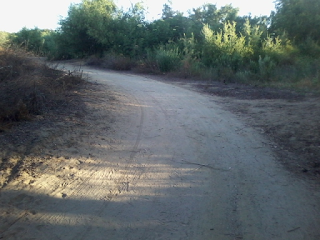 It slowly went across the trail to the brambles. It was so hurt that it could not go on more so I took my nicks and cuts through the blackberry bramble and pulled the rabbit out and gave it a quick rabbit punch to end its suffering. When I dressed the rabbit I saw massive internal trauma from the marble impact. How it ran I will never know but its the reason I try avoid body shots all together. I was able to recover the rabbit thankfully and it made a good conejito in tomatillo salsa. Here's a rabbit harvest contribution from my old hunting friend Jmplsnt you can see the species difference this is an Eastern Cottontail it has shorter ears than the Desert Cottontails I hunt; and he went the route of heavy blunt trauma as his slingshot has a heavy rubber band chain at 4x4x4 and he used .55 caliber lead balls for this hunt. The rabbit he reports was harvested in a Woodland setting at 16 yards a clean head shot. 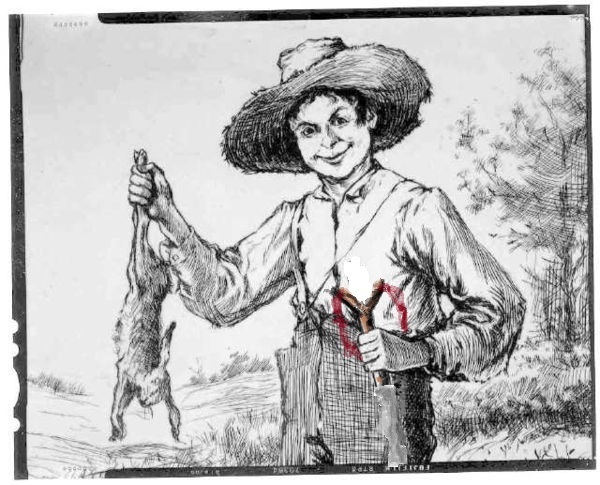 There are many more rabbit harvests with larger rabbits I could share with you my readers suffice to say these are here as a graphic illustration of the possibility of success with dedication and respect for nature and its creations. Lastly I wanted to say again that I advocate the use of gloves when dressing your rabbit harvests whether plastic or rubber both will protect you in case the rabbit is infected with tularemia. I have been lucky to not encounter this problem but its best to play it safe. 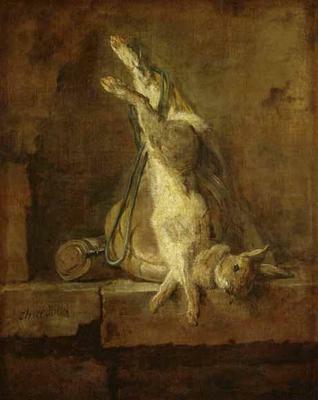 I always tell the rabbit I am sorry for its death and tell it that its sacrifice will feed me and my family. I ask it to return in the web of life again to renew life in the web of all living things. This is the way many Native American tribes treat the game they harvest for their meals. My Grandmother (God rest her soul) when we were kids always told us to thank God for any rabbit or other game we could bring home with our resorteras because all life is precious and its because of their life sacrifice that we continue to live. Good luck in all your hunts and always be safe and try to show some respect to your quarry and give a quick ending if possible. Its sacrifice should not be in vain as it is giving you a quality meat devoid of todays steroid, and antibiotic filled meats on the market sold as "meat". 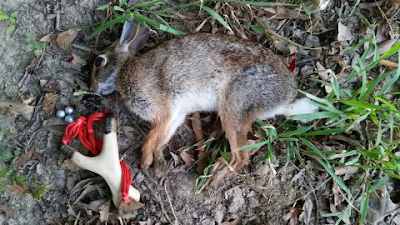 A slingshot's power to harvest small game.. What does it really take? An exploration of traditional slingshot elastics and classical yet underestimated slingshot projectiles for hunting small game, the truth will set you free. In a few of my blog posts I have written on the mechanism by which a slingshot kills and its "killing potential being measured by the "poor man's chronograph the venerable soup or veggie tin can.. This veggie soup can test is on an old blog post I wrote four years ago, the link is here. But I digress as this will more relevant later on in this post as it will better define the finer points of this blog post. This blog post is about a traditional slingshot elastic that has been in use for generations and I feel is a close relative of the old time round solids I used in Mexico as a child. Many know of the Famous Slingshot Master from Thailand as his videos have been on You Tube for a number of years now. The elastic this man uses is native made in his country and it has been looked down upon by the target shooting guru types who draw the slingshot rubber to their cheek and "aim". Shooting in this way some of these "experts" have stated that the Thai Native slingshot rubber is just too slow. What I find ludicrous about such people and their one sided chronograph tests is that they only judge all slingshot rubber by using the same dead method of drawing slingshots when they shoot. A review of the above video show's the Thai Slingshot Master and others in his native country using a different method of shooting than our Tournament flat latex and theraband preaching target shooter gurus. In the videos you can see the Thai slingshot master and other natives shoot these simple solid elastic with power and deadly accuracy with simple stone projectiles. Certainly not the slow weak report of the tournament flat latex gurus. I always wondered if I would ever get my hands on some of this Thai Elastic.. Some time ago my good friend Jmplsnt Administrator of the Rebel Slingshot Forum and a very good slingshot hunter in his own right, gave me some samples of Thai Native Slingshot Elastic to experiment with. He found a good source over seas to order the elastic from. The slingshot in the beginning of this blog post is a resortera I made with the Thai solid elastic and ran some Chronograph tests with. What I discovered in my Chrony tests is that the Thai solid elastic can develop and did shoot 5/8 cat eye marbles at speeds of 170 to 175 feet per second at the high side but an average 170 feet per second was the norm with the Thai elastic and 5/8 marbles. However I did minor hunting with the slingshot and the Thai elastic which mean that the full in the field testing of the Thai solid elastic would remain in the hands of my good friend Jmplsnt. 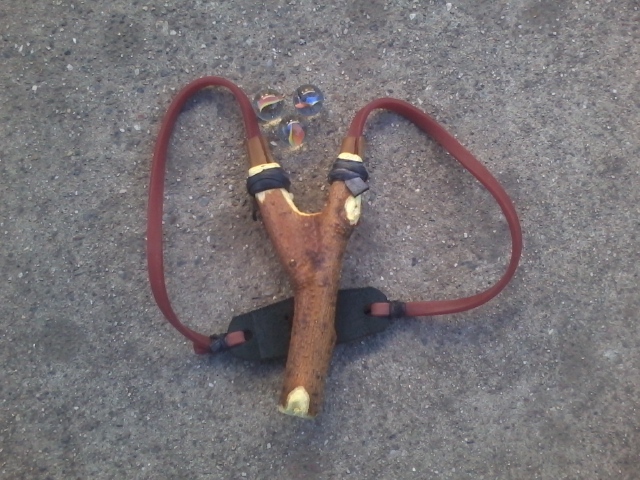 Canicas aka marbles the most underestimated slingshot hunting projectile. Around four years ago I wrote a blog post regarding different types of slingshot hunting ammo. That old blog post can be found here http://nicos-resorterablog.blogspot.com/2012/10/being-prepared-hunting-ammo.html On it I mention Canicas "marbles" as a great ammo for bird hunting and I still stand by this and I also mention that marbles are very capable of killing other game like rabbits if you are confident in your accuracy. Since then I have killed my share of rabbits with marbles so I know if you are careful and good with your shot placement that 5/8 cat eyes or clear marbles and also better 3/4 marbles will all kill rabbits. Some notes: 5/8 glass marbles weigh approximately 1 or two grains difference from a 0000 buck shot otherwise known as the .380 lead round ball. 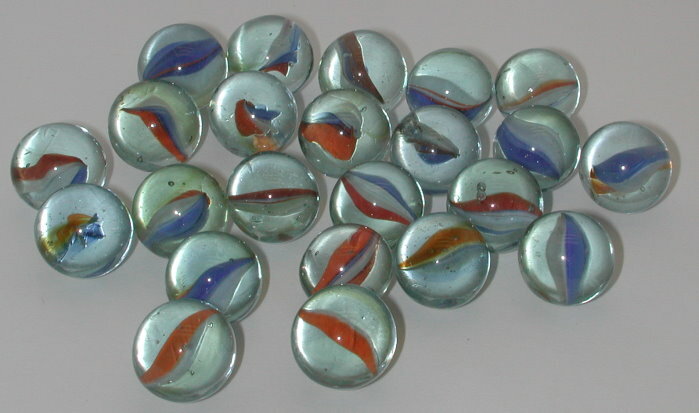 How do marbles kill small game? Simple answer blunt impact trauma. They work along the lines of what I coined the Blunt Trauma Formula this is a section from my old blog post. "The blunt trauma formula is as follows: surface hardness + mass + momentum = blunt trauma of some kind. The blunt trauma formula applied to a slingshot and projectiles of some kind translates to the following, the weight/mass/size and hardness of the projectile, projected by velocity/speed of projectile to create the momentum required, produces the blunt force/trauma required for killing small game. " In the case of the 5/8 marbles they have a large striking surface and being glass are very hard they may only weigh 77 grains which is slightly less than the .380 lead ball. But due to their larger surface are suited to blunt impact. The next requirement is suitable speed to create the blunt impact trauma we need to harvest small game. Anything from 170 feet per second up to 190 is lethal with these marbles. Note: I have killed large pigeons with elastics that only travel 170 and a 5/8 cat eye marble. What does any of this have to do the Thai solid elastic? Some time back my friend Jmplsnt had told me he was going to try and use the 5/8 cat eye marbles to take some Squirrels. That's right Squirrels.. Not with therabands not with tubes nope. The man stayed true to his self challenge and decided to use some cat eye marbles he picked up at the dollar store and his deer antler slingshot "Herne the hunter" armed with Thai Solid Elastic to see for himself if he could bag some squirrels with this dynamic duo. I encouraged my friend to go for it as I felt it would be promising and this is what my friend had discovered. That a canica propelled by the Thai Solid rubber traveling at approx. 170 feet per second is absolutely lethal to a fox squirrel from 12 to 16 yards and the man was generous enough to provide with some old pictures of his body of work in this field. He reports that on both occasions they were perfect head shots and each took only one shot with a very clean kill. 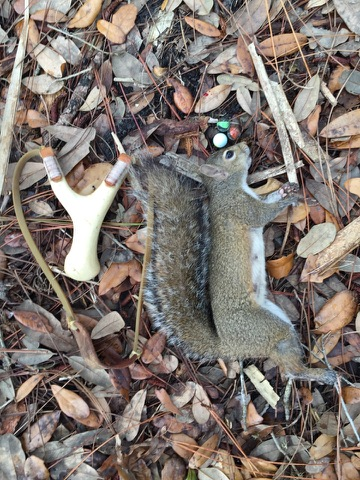 Yes these squirrels were harvested with a simple solid elastic used by the natives of Thailand in daily slingshot use. Used by my slingshot hunting brother in arms Jmplsnt..
What have we learned from all of this??? That it takes a 5/8 glass marble to travel 115 miles per hour (170 fps) the momentum it requires to make the blunt impact trauma to take a critter as tough as a Fox Squirrel. We have also learned that the Thai Solid Rubber is more than adequate for hunting small game with a slingshot just as long as you (and I'm borrowing a term from our good friend Frogman) tax the rubber that is draw it enough to generate speed then it will do the work required of it. And that there are other ways of shooting a slingshot than the draw to the cheek business used by some of the folks out there (nothing against it) but it does not work some types of elastic. I want to take this time to thank Jmplsnt for his contribution to this blog post because of him this Collaborative Blog Post was made possible. Good will to all Slingshot Hunters and as always good luck on your hunts. English rook hunters using a lantern to illuminate Rooks roosting in the trees that they are shooting with a stone crossbow. Disclaimer: This blog post is intended for information purposes only and in no way do I encourage you to use the techniques discussed in the blog post. In most states night hunting is frowned upon so please make sure to check your local laws regarding hunting at night. There are special circumstances in which night hunting is still possible and I will cover these instances in this post. Remember you alone are responsible for your actions and I'm no legal advisor so I cant possibly know what rules apply to your special corner of the world, as with all things use your own discretion. Making a low cost head lamp rig for night hunting with a slingshot. This project was inspired by the creativity of an Electrician that works in the same place as I do. Naturally I immediately saw the potential in the idea for its use in night hunting gear. Why did I make this night hunting rig when you can just buy a head lamp from any store and it has a red beam if you need right? Yes you can buy a head lamp but that's not the reason to ignore this project. 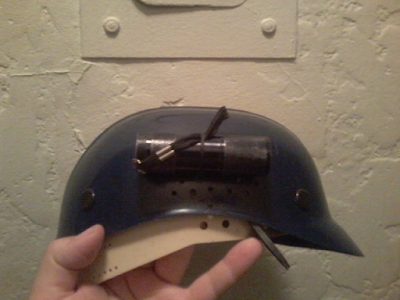 The caveat with head lamps and their use for slingshot hunting at night. From my personal experiences using head lamps and the experiences of others, the problem is shooting accurately? Why does this happen? Simple answer is that the way a head lamp is made, the elastic strap goes over your head and the light beam is fixed in the middle of your forehead just above the in-between of your eyes. What this does is force your head to move in an unnatural fashion in order to have the light in line with your target i.e. the rabbit or roosting pigeon. Many shooters myself included align our heads with the slingshot fork orientation as it is held in our hands. When you are wearing the standard head lamp, the light's position causes you to turn your head in an awkward position and this affects your accuracy when shooting the slingshot at a specific target after dark. Head Lamp line of vision is center line and your head and eyes naturally want to follow this light and this is the problem when shooting with the Slingshot. Whether you shoot with the fork upright or canted you are using either your right or left hand to hold the fork and this will align your feet and head with the orientation of your slingshot fork. The head lamp forces you to instead align with the light and its illumination of your target. This is when inaccuracies occur. 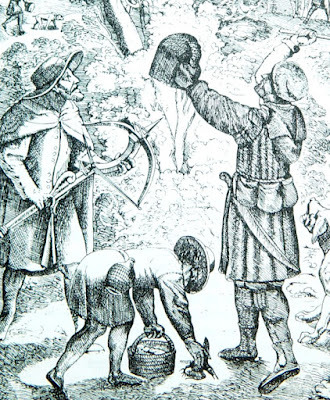 If we look at the old wood cut picture at the beginning of this blog post we see a gentleman holding a lantern illuminating the rooks in the tree whilst the other gent prepares to fire at the rooks with his stone crossbow. Aha! Then the light must be coming from behind the shooter thus illuminating the target and not forcing the shooter's eyes to follow the light. I once had the experience with my resortera of having another illuminate a roosting pigeon which I was able to accurately shoot with ease. I know this seems redundant but it is not: Enter the electrician at work. Where I work I saw a man an electrician rig up his hard hat with a flash light on the side of his head to help him see the electrical components he regularly fixes at work on the various machines. I tried this and this is what I came up with and here is the project. 1. 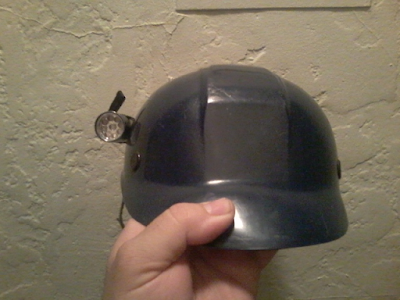 A hard hat (I got mine for free at work) but they can be purchased inexpensively from prices of $5 to $10 USD. Note you can use a baseball cap instead but it will take some stitch work. For now we stick with the hardhat. 1. 9 led small flash light I purchased mine from the 99 cents only store and it worked perfectly for this project. Now to making the hard hat ready. Take the knife and you want to slowly make two holes vertically on the side of hat that is the same side as the hand you hold your fork with. (I hold fork in right hand) carefully drill two deliberate holes just above on the hard hat side close to but before your ear area. In theory we are done and this is enough for night hunting rabbits that may be plaguing your garden at night. However with some critters you are hunting at night, the normal led light will spook the critter. This happens a lot with Pigeons roosting in barns or in the underpass of a bridge they know the led light means trouble. How do we get past this? With a red light that's how we do it, for some reason creatures like Pigeons aren't spooked by the soft light of a red lamp setting. 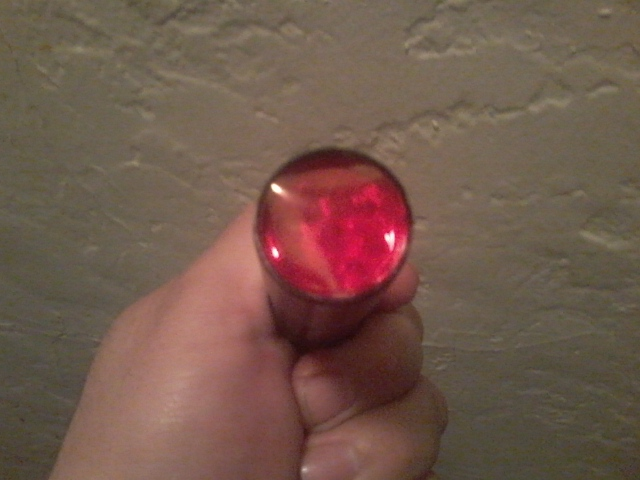 We are now going to make a red lens for our led lamp set up. 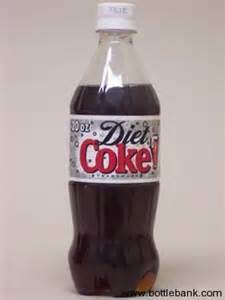 Make a cut in the middle coke bottle as you can see this is a flat part of the bottle. Do your best to cut this center ribbon out and when it comes out it will naturally roll on you. Next take your sharpie marker and the led lamp and flatten the plastic strip and gently outline the mouth of the led lamp and cut out a circle. Next slowly and carefully cut just enough so that this clear circle will fit snugly inside over the lens of the led lamp it should naturally stay inside as there is a lip inside this part of the lamp. 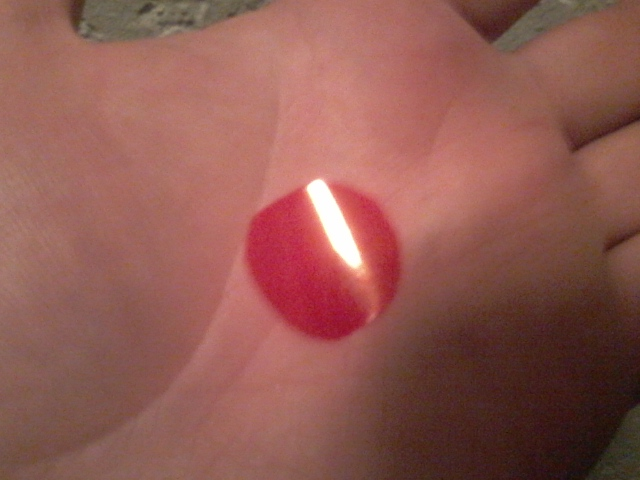 If you were careful with the cutting you will be able to gently pop out this new lens and put it back as needed. Next take the red sharpie marker and color your plastic make shift lens with the red marker and let it dry and do both sides of this lens. Like this you simply have to carefully place it inside the head of the led lamp over its first lens. Then this is your red beam lamp ready to go. There you have a complete red light lamp that will help you in shooting roosting pigeons at night to shooting nervous rats as they also are confused by the red light. Noted it is not as professional as a high end and high cost red light setting on a head lamp but it will work perfectly for our night hunting uses. Also the light created from this rig will give your eyes the illusion that someone else is holding the lamp on the target for you and this will allow you to shoot in your natural slingshot position thus improving your accuracy by a great margin. It cost me at the most $5.00 to create this head lamp rig and it has a red lens that can be removed for the normal setting when going after rabbits. Give it a try if you have an invasion of pigeons in your barn or if the rabbits are raiding your garden now you have a means to shoot with greater accuracy at night. To quote a fellow hunter : We operate a low cost operation here. A 3rd generation Resortera/Slingshot maker. First generation born in the USA Mexican desecendant my slingshots are of Mexican tradition with some subtle influences gained from my upbringing in the Barrios of Los Angeles County. I am a slingshot hunter and a craftsman carrying on the old traditions of my family and helping others to know that in a modern world you can still make some effective old school slingshots.